This volume focuses on a number of research questions, drawn from social movement scholarship: How does nonviolent mobilisation emerge and persist in deeply divided societies? What are the trajectories of participation in violent groups in these societies? What is the relationship between overt mobilisation, clandestine operations and protests among political prisoners? What is the role of media coverage and identity politics? Can there be non-sectarian collective mobilisation in deeply divided societies? 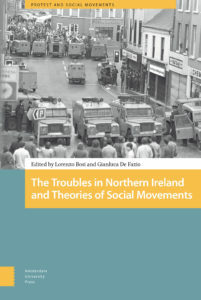 The answers to these questions do not merely try to explain contentious politics in Northern Ireland; instead, they inform future research on social movements beyond this case. Specifically, we argue that an actor-based approach and the contextualisation of contentious politics provide a dynamic theoretical framework to better understand the Troubles and the development of conflicts in deeply divided societies.